An interview with Deepak Gupta, the attorney in Hernandez v. Mesa. A federal agent standing on U.S. soil shot and killed someone across the border in Mexico. Was the shooting unconstitutional? 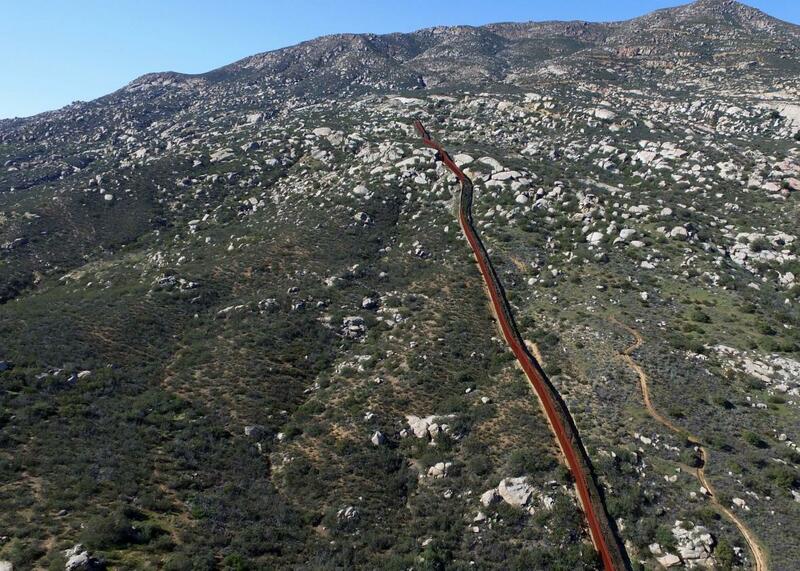 The fencing on the border between the U.S. and Mexico in Tecate, northwestern Mexico, on Jan. 26. Deepak Gupta is the attorney representing the Hernandez family. In the most recent episode of Amicus, Slate’s Supreme Court podcast, Gupta joined Dahlia Lithwick to discuss the unexpected salience of this case under a Trump administration. You can read excerpts from the interview below, or listen to the entire interview with Gupta by clicking on the player beneath this paragraph and fast-forwarding to the 16:40 mark. The court couldn’t have known when it took this case how events in the world were going to play out, but it is eerily relevant to what’s happening with the Muslim-ban litigation. A central argument that the federal government is making here is that these Customs and Border Protection officers in effect should not be subject to judicial review, because if we don’t have a damages action for the family of this victim, there is no other way to get into court to test the constitutionality of what occurred here, and even to get to the question of whether the Constitution even applies. And what the solicitor general’s office is saying is that because this case implicates, in their view, questions of foreign relations, national security, and immigration, the executive’s judgment should be trusted, and the courts do not have a role to play in judicial review. And if that sounds familiar, it’s because it’s precisely the argument that the president’s lawyers have been making in the Muslim-ban litigation that’s played out around the country. This is an agency that has become really unaccountable. A lot of its actions either cannot be or are very difficult to test in the courts because it has a law enforcement culture of impunity, because complaints are discouraged, and because officers who commit egregious acts of misconduct are not disciplined—there really has to be some kind of check here. Given current events, I’m hopeful that the court will recognize that that needs to happen. The justices read the newspaper; they watch television. I think they see that there are these raids all across the country, families are being torn apart in ways that really just don’t make much sense. And I’m hopeful that that will affect the way the court sees the case. Of course the court is going to decide this case on the law, but the law is not blind. It takes account of current realities. And so, I think when the Trump administration solicitor general’s office stands up next week and says, “You should trust the executive, and the courts have no role to play,” that argument is going to have a lot less credibility now than it would have had a few months ago. What we’re asking for here in this case is a pretty modest holding. We’re asking for the court to hold that law-enforcement conduct that occurred entirely on U.S. soil—so it’s domestic conduct, entirely—should be subject to judicial review under circumstances where, if the victim were a U.S. citizen, everyone would agree that there would be an egregious constitutional violation. That is not too much to ask, and it doesn’t mean that we’re constitutionalizing things like drone strikes in Pakistan or all sorts of other national-security operations that I think everyone agrees are within the apex of presidential power.